Labor Day’s the last big day of the summer for the hot dog. 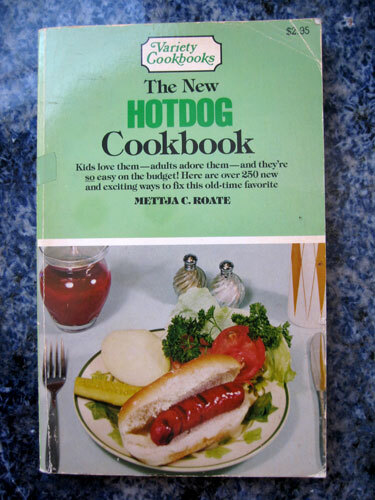 This gem of a cookbook exalts the foodstuff maintaining that hot dogs “are good for you too”, a premise that’s music to my ears as I love the dogs so. “The fullproof way to family mealtime magic!” include classics like Eggplant And Hot Dog Mountains, Drunken Dogs, Hot Dog ‘n Liver Sausage Loaf, Wilted Lettuce Made With Hot Dogs, Shoestring Hot Dog Dish, Dog and Yam Casserole, Festive Hot Dog Soufflé, Doggy Puffs, French-toasted Surprises, Gourmet Hot Dogs Veal Loaf, Polish Bread Soup with Hot Dogs, I could go on and on because I love hot dogs so but just know that there are hundreds more. There are even two pages on “Purchasing Hot Dogs” as well as a lengthy introduction about Mr. Nathan Handwerker, the man who, despite hot dogs first appearing in St. Louis in 1904, thrust them into the lexicon of pop culture some years later when he erected Nathan’s Famous Coney Island Hot Dog stand where the meat tubes sold for five cents. Handwerker paid handsome young men to dress in starched white doctors uniforms and stethoscopes to eat the wieners in front of the stand until rumor took hold that if doctors ate five cent wieners they have to be good for you. At the time of publication, 1968 and reprinted in 1983, the author, Mettja C. Roate, claimed that the average American citizen ate 80 hot dogs a year, enough wieners to make three round trips to the moon if they were laid end to end. Labor Day’s the last big day of the summer for the hot dog. This gem of a cookbook exalts the foodstuff maintaining that hot dogs “are good for you too”, a premise that’s music to my ears as I love the dogs so. “The fullproof way to family mealtime magic!” include classics like Eggplant And Hot Dog Mountains, Drunken Dogs, Hot Dog ‘n Liver Sausage Loaf, Wilted Lettuce Made With Hot Dogs, Shoestring Hot Dog Dish, Dog and Yam Casserole, Festive Hot Dog Soufflé, Doggy Puffs, French-toasted Surprises, Gourmet Hot Dogs Veal Loaf, Polish Bread Soup with Hot Dogs, I could go on and on because I love hot dogs so but just know that there are hundreds of more recipes. 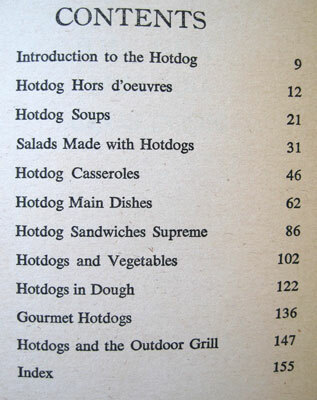 There are even two pages on “Purchasing Hot Dogs” as well as a lengthy introduction about Mr. Nathan Handwerker, the man who, despite hot dogs first appearing in St. Louis in 1904, thrust them into the lexicon of pop culture some years later when he erected Nathan’s Famous Coney Island Hot Dog stand where the meat tubes sold for five cents a pup. Handwerker paid handsome young men to dress in starched white doctors uniforms and stethoscopes to eat the wieners in front of the stand until rumor took hold that if doctors ate five cent wieners they have to be good for you. Happy Hot Dog Lovin’ Labor Day!